Weeknight tip for today: Get all grocery items for the week ahead of time. 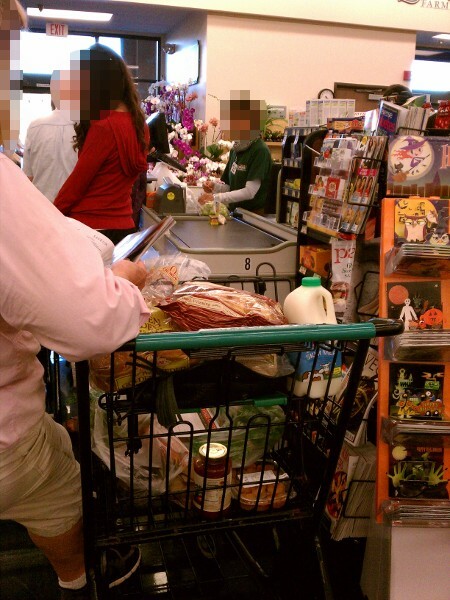 Going to the grocer for that one forgotten or newly inspired item is grossly inefficient. 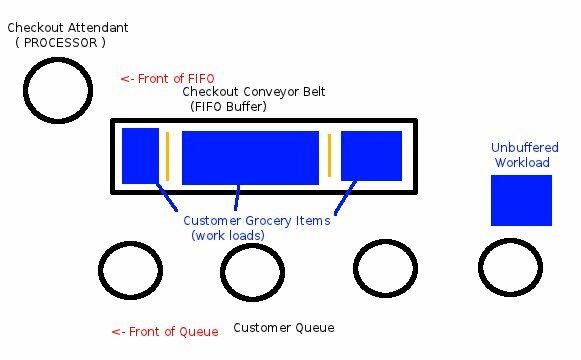 The Grocery Store Architecture usually works well, but it requires that the customer nodes within the queue are dutifully loading the buffer. In an effort to improve throughput and space utilization, some customers (like myself) tightly pack and stack items to take up less footprint, leaving more room for the next workload. (it drives my wife batty sometimes). Regardless of clustering levels, the buffer has to be fed for the system to operate at peak performance. Reading Task Interrupt has locked the "Arms" Semaphore preventing the Buffer-Load Task to complete. One pitfall of many grocery checkout arrangements is the excess interrupt sources (distractions, impulse buy items) that are in place. Just look at the scenario above: so many colorful pages, tempting candies, and festive decorations that have to be masked out or disabled by the customer upon queue entry. As we can see, failing to disable interrupts can lead to the Buffer Load Task being starved for resource (arms), leading to Buffer Under-Run.